​This is the place where you get encouragement no matter what stage you are at in your garden for pollinators. As part of the project, we offer a certification program where people who plant pollinator patches can register and we'll add their location to a map that lists patches across the city. 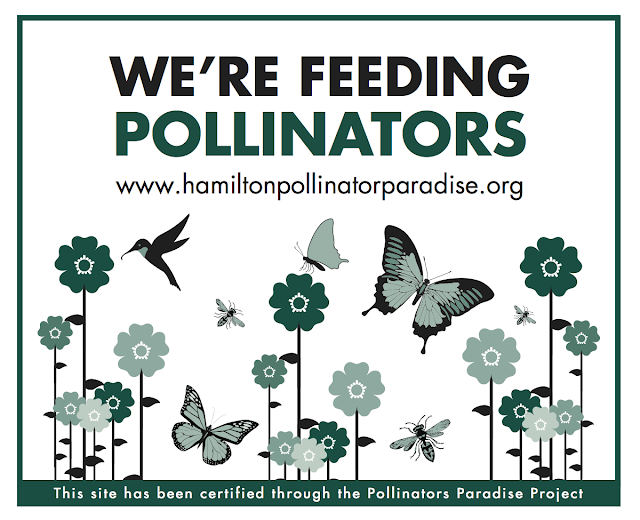 You can certify your new or existing Pollinator Paradise patch to show that you are creating habitat and contributing to pollinator conservation in Hamilton. Pollinators are in search of a quick sip of nectar, some tasty pollen and building materials to take back to their nests. In order to have your Pollinator Paradise certified, each of these habitat requirements needs to be met. Size and Exposure: A suitable Pollinator Paradise can be easily integrated with an existing garden. There is no minimum area requirement in order to certify your habitat; however, a truly effective Pollinator Paradise will be at least 9m2 (100ft2). The total area may be split among several sites at your location and there is no upper limit for the size of a Pollinator Paradise. Pollinator plants need lots of sun and your Pollinator Paradise needs to be located in an area that receives at least six hours of sun a day. Shelter: Leave some dead wood piled up for wood dwellers and areas of bare soil for soil dwellers. An alternative is to build a bee nest box, visit the website below for details. Plants: Attract a variety of pollinators by planting different native species, including wildflowers, shrubs and trees that provide flowers throughout the spring, summer and fall. Native pollinators are attracted to blue, purple and yellow flowers. A Pollinator Paradise should contain at least 8 species of native plants. Plant in clumps as pollinators are more attracted to groupings than single plants. It is important to avoid plants grown with pesticides and to avoid the use of pesticides. Water: Ensure there is a source of water (ex. a shallow dish filled with rocks) and replace the water regularly. Maintenance: You should have a plan to sustain your Pollinator Paradise, particularly in the first few years until the plants become established. Specific actions you take will depend on the features of your habitat and can include mulching, thinning, watering, eliminating insecticide use, and removing invasive plants. Be sure to visit www.hamiltonpollinatorparadise.org for updated information on how Hamilton is becoming a Pollinator Paradise. (1) Create a pollinator patch - this can be done from scratch by planting a diversity of native plants that are attractive to pollinators. You may already have a pollinator patch that can be certified as a Pollinator Paradise. If so, go to step 2. (2) Confirm that Pollinator Paradise criteria are met and complete the Certification Application. Requirements are included with the application materials. Submit it online or download and print it out to mail or fax. (3) You will receive a weatherproof sign for display that identifies your pollinator patch as an official Pollinator Paradise. Please submit photos of your Pollinator Paradise to be included in the online map. (4) Enjoy your Pollinator Paradise and encourage others to create their own! Please fill in the online form below.